I have my VM open, using 2 monitors full screen. When my mac host goes to sleep the Windows 10 guest goes to 1 monitor, and on that monitor it goes to 800x600 instead of full screen. I am unable to get resize the actual Windows 10 screen although I can resize the VirtualBox container window, also I am unable to discover the second monitor. If I reboot the Windows 10 guest, it works again. Untitled.png (23.3 KB) - added by NullVoxPopuli 3 years ago. Untitled.jpg (225.7 KB) - added by NullVoxPopuli 3 years ago. However, now it seems changing the height of the VM Window doesn't resize the Guest. I can also fix it by re-inserting and installing guest additions. I dug a little deeper and found a device driver problem and an event log (not too much detail here though). 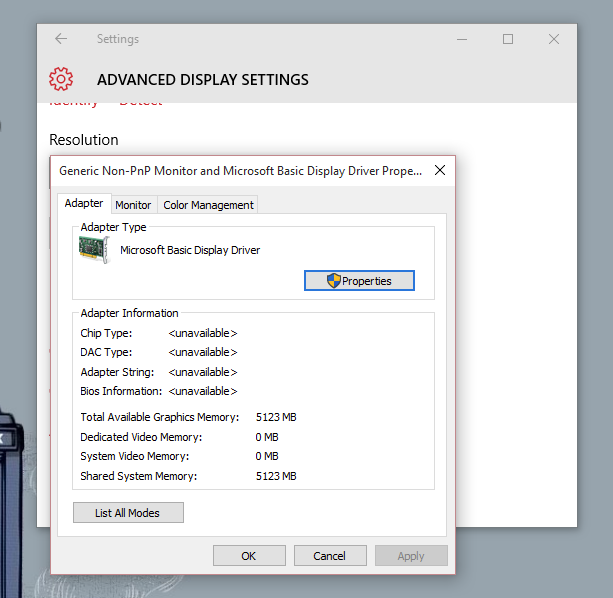 It seems like the device driver messes up and Win 10 reverts back to the default "Microsoft Basic Display Adapter" which does not have the proper screen resolutions available to it. This issue was in the preview build of Virtual Box and Windows 10 preview before. Display driver VBoxVideoW8 stopped responding and has been successfully disabled. Linux host has the same problem. Disable Close display in windows 10 power manager setup, VB display driver no longer crash. Find exactly the same behavior on a Solaris host. Virtualbox display driver crashes after some time and is replaced by the basic display adapter. A reboot of the guest system re-enables the virtualbox display adapter. Workaround suggested by kmwang seems to work. In the Windows 10 guest, go to Power Options > (choose plan that you use, most likely "balanced") > Change Plan Settings > Disable the "Turn off display" on battery and Plugged in. I'll post again if this fixes the problem. 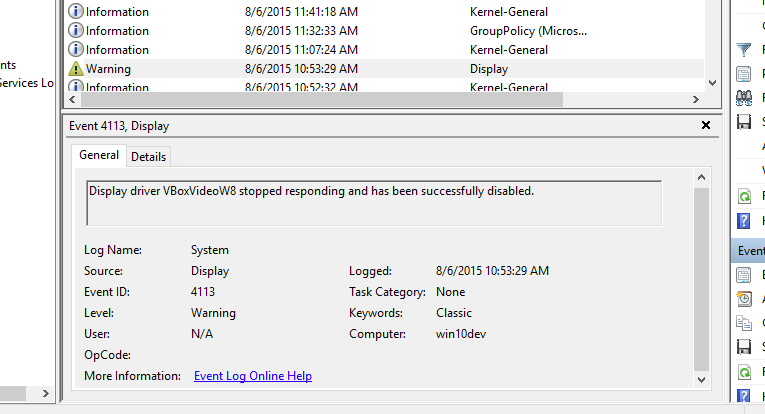 This just happened to me using versions 5.0.2 of vbox and guest additions, and Windows 10 build 10525 guest. I don't recall this happening any of the many times my OS X host went to sleep while I was using vbox 5.0.0 and the initial release build of Win 10. (Unfortunately they were both updated the same day, so I can't tell which introduced the problem.) I don't use multiple monitors or use vbox full-screen. Confirmed with "Oracle VM VirtualBox Guest Additions 5.0.3r102316" I have not found a work-around. Turning off my Bluetooth earpiece stopped the crashes for now. I hope this helps. I am having this exact same issue with a Fedora 22 host running VB 5.0.8_r103449 and Windows 10 10565 as the guest. I think I'll give kmwang's idea a shot as that seems to be the most likely scenario which is causing it. I only have this problem if I switch away from the VM for a long enough time or the host sleeps. After adjusting my power settings to never allow the display to turn off, I have not had this issue occur again. I'd recommend making this affect any host where the guest OS is Windows 10. This is very much a guest OS driver issue that isn't handling the display being powered off by the OS. Kudos to kmwang for discovering the solution! Same problem here with linux host (VirtualBox Version 5.0.10 r104061) after upgrading windows 10 pro (x64) to version 1511 (OS Build 10586.14). 1) With the previous windows build, I didn't have this problem. 2) Adjusting my power settings to never allow the display to turn off didn't solve the problem. 01:27:05.156651 GUI: UIMediumEnumerator: Medium-enumeration finished! Generally, the only app I open in this VM is Visual Studio 2015 Community Edition -- no gaming or other graphics-heavy apps. I've just changed the power setting, I'll report back if it helps or not. I'm having the same problem on 5.0.10 with Windows 10 guest (x64) on Ubuntu host, anyway this is nothing new. Since the problem seems related to Guest Additions not correctly reporting host display power off, so that the guest OS thinks the Vbox Display driver has stopped working and replaces it with the default driver, I would suggest to change Host Type to "all" and Component to "Guest Additions", making it clear that this issue affects a much larger number of users (it is quite common to have the latest Windows in a VM on any non-Windows hosts). Thanks for a quick fix. I confirm the above reports: this bug, which appears to be in the Win8/Win10 display driver installed by Guest Additions, still exists. I first encountered it after I transitioned from a Win7 Guest to a Win10 Guest, recently. When I first saw the bug, the display went to 800x600. I was able to increase the size in Win10, and currently my system changes the display from 1920 or 2560 pixels wide to 1600x1200. The Win10 system is usable, but this is a frustrating loss of functionality. As others have reported above, I confirm that normal full-screen operation can be restored by either restarting Win10 or by re-installing the Guest Additions. I briefly thought that I had found a workaround, by always saving the state of the VM when not using it, but then I witnessed the bug occur immediately after restoring the state of the saved VM. I saw Win10 change to the reduced machine display size, and pop up a small temporary window informing me that the display driver was not responsive, and had been replaced. That failure of my hoped-for workaround prompted me to file this report. My Host is a MacBookPro running El Capitan 10.11.2, running VirtualBox 5.0.10 r104061, and my Guest is a 64bit 1cpu Win10pro v1511. I expect that the bug only depends on running a Win10(or Win8) Guest under VirtualBox 5, with the (faulty) VBoxVideoW8 display driver installed by VB5 Guest Additions. NOTE: the ticket for this bug, as filed five months ago, says that it is for Mac hosts; that is probably wrong -- the bug probably occurs for ALL HOSTS. UPDATE (13 days later): The 'workaround' discussed above (always saving the state of the VM when not using it) almost always works, and so I recommend it. In addition, several days later, 'andyfraley' below recommended setting AutoResizeGuestDisplay, and I did that. I cannot yet prove that this is a cure, but the bug has not happened recently, so I recommend this change also. I am having the same problem here. I updated my Windows7 Professional to Windows 10 TH2 on VirtualBox 5.0.10 and later upgraded to 5.0.12. The host is a MacBookPro Retina Mid 2012 running El Capitan 10.11.2. Hope it gets resolved soon, because I like being able to use Windows in full 'Retina' resolution (2880 x 1800). Same problem here. MacOS El Capitan and VirtualBox v5.0.12 running Windows 10. Fixed mine by re-installing Guest Additions and checking View | Auto-resize Guest Display. Just arrived back at my desk after an absence and both my Win10 VM's have had their display adapters crash. So, my previous comment about it only affecting the foreground task was incorrect. Plus, changing the power management of the host display has had no benefit. I checked the Windows event log in one of the guests but there's just an entry saying "Display driver VBoxVideoW8 stopped responding and has been successfully disabled" Not very useful. There doesn't seem to be anything relevant in the host logs. I have also tried the Auto-resize work around suggested above, but that hasnt has any effect. I have the same problem with a Debian Jessie host and Windows 10 guest. All other guest type seem to work correctly. Windows 10 guest starts with correct display resolution, then after a few minutes changes to the "basic" low resolution display. Restarting restores the correct resolution ... for a few minutes. Wonder why no one has attached a VBox.log file of a VM session where the problem happened. Enable 3D acceleration in the VM settings. Had an idea the other day and changed the display turn-off option to "never" in the guests as well as the host and haven't had the problem since. It's been 2 days now. In reference to Sunlover, my cpu's are, and always have been, set to 1, and I can't use 3D acceleration. If I turn it on, vb crashes. So, since I don't need it it's always off. This seems to have fixed the issue for me (on the Mac). Forgot that we had to dig into the Bios of windows machines to enable this for the VM to work too. Running Ubuntu 14.04 as Host. Seems to have fixed my issue as well. The "VBoxVideoW8 stopped responding" problem is fixed in Guest Addition 5.0.x r105299. Please download latest 5.0 Guest Additions from https://www.virtualbox.org/wiki/Testbuilds and test. Thanks. Update. Turned 2D acceleration on. The problem reoccurs but seems less frequent. Next step is turning on 3D acceleration. 15 min later: I'm back, 3D acceleration causes a complete VM crash just after the "Welcome" page appears. First time: the VM crashed and after about 15 secs the VM screen disappeared and I was back to the host desktop screen. Second time: at the same point, the VM (and host) crashed and I had to reboot the host by holding the power button in. I'll stick with 2D acceleration. When 'sunlover' asserted 9 days ago that Guest Addition 5.0.x r105299 fixes the problem, I installed that test version. I wanted to read the changelog for this code version to see a bug explanation by the programmer, but could not find the log. Where is it?!? For 9 days the bug did not occur, but then it did, once again. Now I am even more interested in seeing the changelog for r105299! My experience is that the most reliable workaround for this bug is to save the state of the guest when it is not in use. The fix is part of VBox 5.0.16. Before you attempt to reopen this ticket, please test carefully (of course, don't forget to install the 5.0.16 Guest Additions). enabling 2D acceleration brought my window contents back. So now I have both 3d and 2d accel. enabled. going to preferences -> Display. and changing the Maximum Guest Screen Size from 'Hint' back to 'Automatic' appears to have resolved the issue. after restarting, the Guest resized itself to the size of the window. NullVoxPopuli, the original problem in this ticket has been fixed. Please open a new ticket for the problem with your VM. If you do that, the do not forget to provide VBox.log.